The Boscam FR632 is arguably one of the best FPV receivers on the market and now it has been made even better thanks to its recent upgrade, which provided an additional 8 channels to make it RaceBand compatible. Note that it still offers all of the 32 traditional FPV channels, so it's fully compatible with other 5.8Ghz gear on the market including Fatshark & ImmersionRC gear. In addition to the FR632's wide range of frequencies, it also boasts many other features including, a true 40 channel diversity receiver with dual AV outputs which can be used to feed a monitor or goggles; auto channel search at the push of a button, and a clear LCD display that shows band/channel and the actual frequency number. It also supports a wide input voltage range 6-28v making it compatible with most power sources, including LiPo batteries. Finally, we're also impressed with the construction of the FR632. The Rx is contained within a durable metal case, which also acts to shield the receiver increasing its sensitivity. Why do I need a diversity reciever? A diversity receiver is essentially two receivers all in one. In essence, it allows you two mix and match antennas for a solid video link. So it might be that you select a circular polarised omnidirectional antenna, which will provide good reception in all directions in the near field, and a directional high gain patch antenna for long distance flights. The diversity receiver is clever in that it will seamlessly switch between the receiver with the strongest signal. Note that many shops are still selling the the old FR632 32-channel version, which does not support RaceBand. For best range and video link stability we recommend using circular-polarized, Patch or Helical Antenna Set (SMA), see 'related products' below. How many av signals can FR 632 receive at the same time? Can it receive two video signals coming from two different cameras on a drone that is 100 m away? 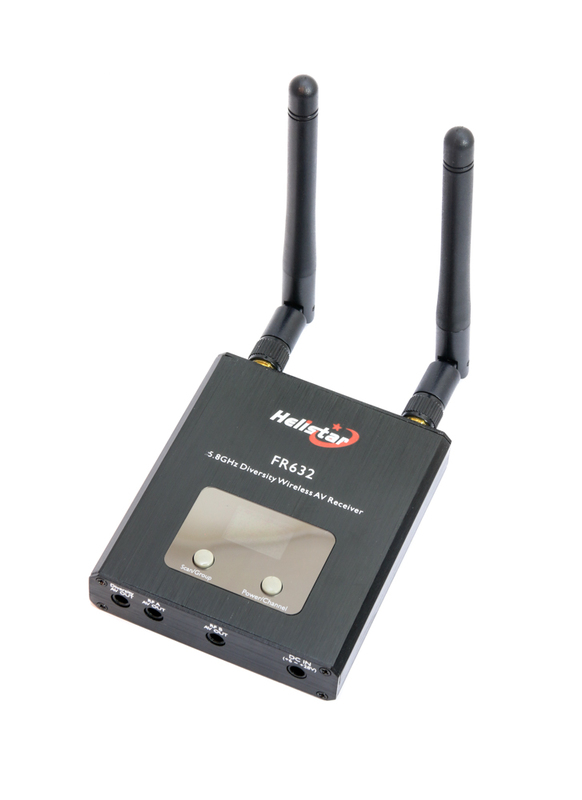 The FR632 will can tune into just one video signal, you would need two receivers to receive video signals from two separate cameras/video transmitters. Alternatively you could use a video switcher, which would allow you to cycle between multiple cameras.